Welcome to the Crazy Crafters Blog Hop featuring projects using products from the new Occasions and Sale-A-Bration catalogues. We hope you find great inspiration from the projects. For my project I've used the Petals & More Thinlits from the Occasions Catalogue and one of the Celebrate You Thinlits from the Sale-A-Bration Catalogue. I've paired these with dies from the Bouquet Bunch Framelits in the Annual Catalogue. I coloured some Basic Rhinestone Jewels with my Stampin' Blends alcohol markers - first with Bermuda Bay and then a dot or two of Night of Navy. The base card is thick Very Vanilla followed by an edge of Copper Foil Sheet and then a layer of Very Vanilla. I cut the middle out of the Copper so that I can use it at a later date. For the banner, I cut a 1" strip of Very Vanilla and a strip of Copper that was 1/8" longer and wider. I then used the Banner Triple Punch to notch the ends. 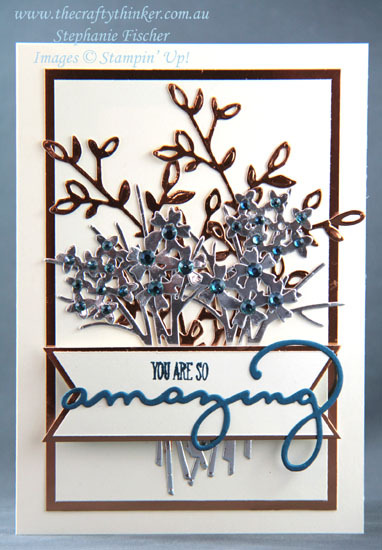 The word "amazing" is cut out of Dapper Denim cardstock and the words "you are so" are stamped in Dapper Denim. The Banner is adhered with Stampin' Dimensionals. Since the Celebrate You Thinlits dies are in the Sale-A-Bration catalogue, they are FREE with a qualifying purchase - in this case a purchase of $180. I've already used them HEAPS! They're so worthwhile getting if you can squeeze in that $180 order or maybe consider hosting a party. For more details about the amazing Sale-A-Bration savings, visit my Specials & Promotions page. I haven't yet acquired the Amazing You stamp set (Sale-A-Bration catalogue) that coordinates so well with the Celebrate You dies so I used a Dapper Denim Stampin' Write Marker to ink up only the three words on one of the Just Add Text stamps. This card was very influenced by the Perennial Birthday Project Kit. As I'll share with you soon, I didn't purchase the coordinating Perennial Birthday stamp set so I used one of the Celebrate You dies on some of the cards instead. I liked the effect so much that I made this card!